Although my partner and I have similar views on the environment and living sustainably, we both have differing priorities. One of my partner’s big priorities is fluoride. For some reason fluoride has never really featured highly on my radar of things to be concerned about, and for the longest time I’ve used fluoride toothpastes. But in face of opposing scientific views we’ve been trying out various fluoride free toothpastes to see which we like the best. This post has been a really long time in the making – over 9 months! The reason why is I wanted to get a dental checkup in after using fluoride free toothpaste for at least 6 months to make sure my teeth stayed healthy before making any recommendations to you. I had a checkup from my regular dentist in November, after 7 months of dedicated fluoride free toothpaste usage and came away with a clean bill of health. In fact, after checking my teeth my dentist said to me that normally after 6 months people have a small build-up of tartar, especially at the back of their lower front teeth. He then said “I don’t know what you’ve been doing, but you’ve actually got no tartar build-up“! I’ve been seeing my dentist for years, and this was the first time he’d said this to me or didn’t have to scrape of any tartar so I was a pretty happy camper! I hadn’t told him I’d switched to fluoride free toothpaste for fear of a telling off, but I don’t want to make any claims because whether it’s down to switching toothpaste, or toothbrush, or just more vigorous brushing (to make up for the lack of fluoride) or changes in my diet, or just plain old luck I just don’t know. My partner also got a clean bill of health at the dentist after 6 months of usage, so it’s a definite thumbs up for fluoride free toothpaste from us! No reports of bad breath either! This was the very first fluoride free toothpaste we tried and I’ll be honest – I straight up hated Sarakan Toothpaste. I didn’t like the taste or texture, much as I tried to get used to it. I found the smell and taste of geranium a bit too overpowering, and there was definite hint of parsley (my least favourite herb). My partner said it smelled like a greengrocers (I think it was the parsley), but as a parsley and geranium fan he loved the taste and as soon as it ran out he wanted another tube, so this was hit with him. 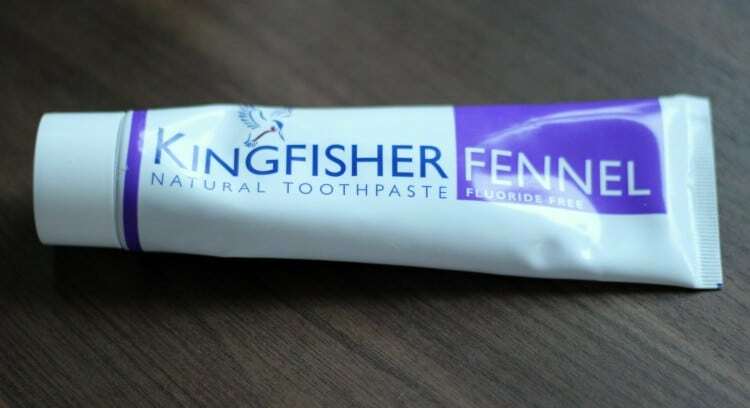 I struggled to find a Kingfisher mint flavoured fluoride free toothpaste locally (they do make a fluoride minty one, so do look out) and in the end settled for their Fennel fluoride free toothpaste*, which I found without problem in my local branch of Holland & Barrett. My partner again loved this – he said it was like, in his exact words, “a lovely big liquorice“! I, however, wasn’t so keen. 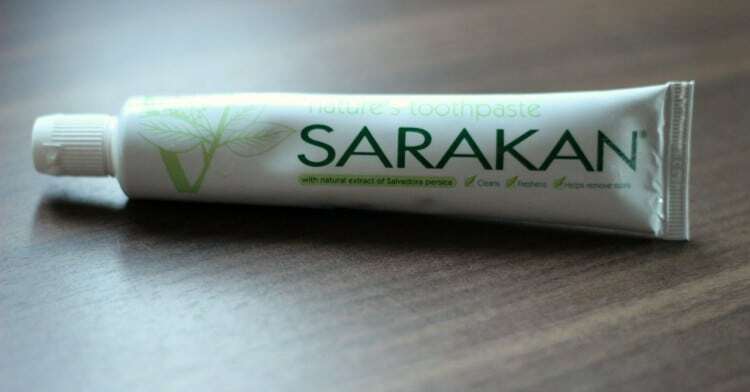 It didn’t think it tasted as bad as Sarakan, but by this stage I had come to realise that I liked traditional minty style toothpastes and the clean and fresh feeling they impart, over the fennel taste. My partner says this is his absolute favourite toothpaste – and now his regular paste of choice. 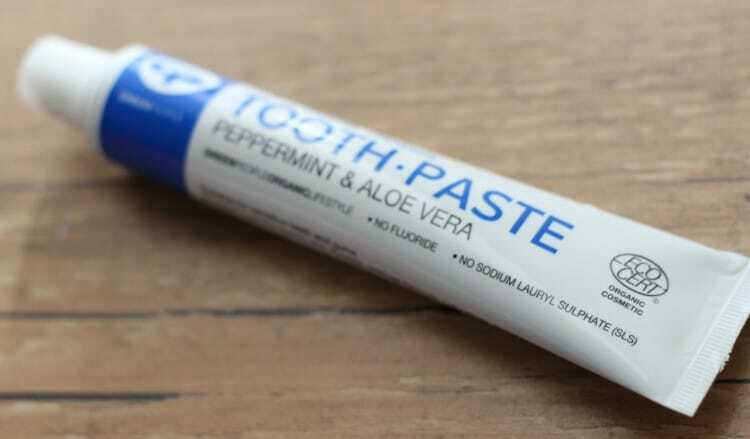 After trying the other two fluoride free toothpastes, and even with the promise of peppermint, the sound of the aloe vera in this Green People peppermint and aloe vera toothpaste* didn’t exactly fill me with joy or anticipation, nor did the putty colour. So I was quite surprised to find I actually really liked this toothpaste, and have since gone through a further two tubes! Sometimes I have to load a bit more toothpaste on to my brush half way through, but my teeth always feel squeaky clean and I like the gentle and clean minty taste. I don’t notice the aloe vera until after I’ve cleaned my teeth but I quite like the aftertaste. My partner conversely straight out hated this toothpaste (two peas in a pod we are!) – he said he could taste the aloe vera quite strongly as he was brushing his teeth and didn’t like it. I loved this Green People Minty Cool toothpaste*. Again, it’s putty coloured, and like all sodium laureth sulphate free toothpastes it doesn’t foam up in the way as the more chemical filled toothpastes, but once you get used to that it’s great. It’s minty in the way that all great toothpastes are (in my opinion!) and my teeth feel clean, and my mouth refreshed after brushing. Again, like the peppermint and aloe vera toothpaste, I sometimes have to add a bit more toothpaste on to my brush half way through brushing, but I don’t mind that too much. My partner’s also a fan of this one – the only one we agreed we both liked! Result! Lush Toothy Tabs are the most environmentally friendly tooth cleaning product you can currently buy, as it’s the only one that’s plastic free. However, and it’s a big however, we both found that it tastes absolutely disgusting. I wanted to like the Toothy Tabs, in fact, I wanted to love the Toothy Tabs but we just couldn’t. Rather than a paste, you chew on a tablet, and then start brushing once a foam develops. Unfortunately we found it tasted like chewing on a particularly horrible aspirin. The taste and texture made us both heave and we had to spit it out within seconds. Our mouths didn’t feel clean in the slightest, we felt pretty sick, and have now relegated the Toothy Tabs to the very very back of the cupboard for extremely extreme toothbrushing emergencies. I personally hope that day never comes – even thinking about these 7 months on after we first used them sends shivers down my spine! You can buy them in different flavours. I went for Dirty as it’s a traditional minty flavour – but who knows, the other flavours might taste better? 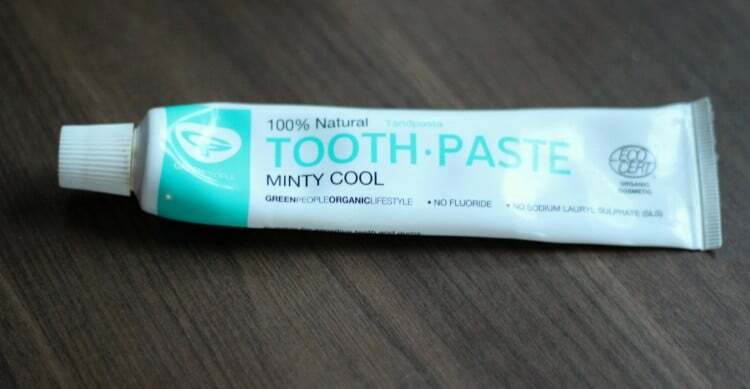 So, to conclude, if you’re in the market for fluoride free toothpaste and like things minty, I’d recommend the Green People Minty Cool toothpaste* (I 3 at at time as you save £1). 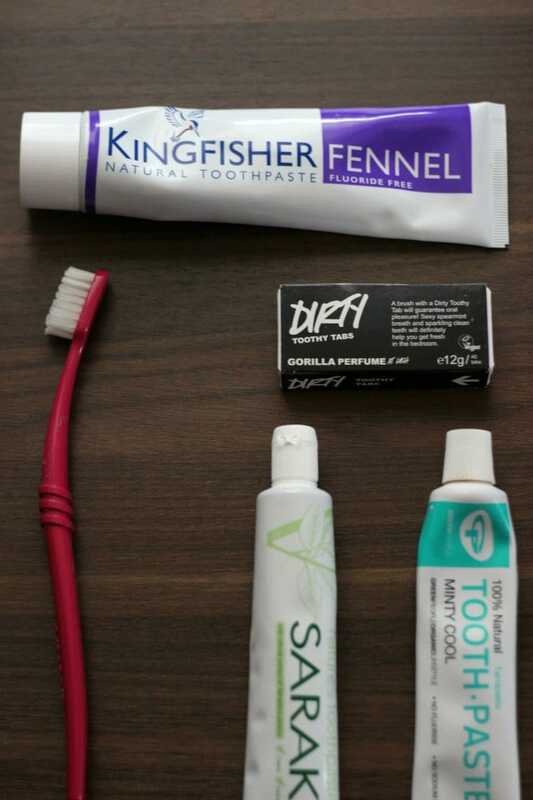 If you’re feeling adventurous and into different flavours I’d try out the Kingfisher Fennel Toothpaste* or Sarakan. Do you have a favourite fluoride free toothpaste that I’ve missed? Let me know in the comments below. A note on toothbrushes. I decided to switch toothbrushes to something more environmentally friendly. I tried bamboo toothbrushes but couldn’t find one I got on with. At first I found the sensation of brushing my teeth with what felt like a lolly stick in my mouth uncomfortable, and once I got used to it after a few weeks, the brushes started to fray really badly, and I found I had to replace my brush every four weeks. Even though bamboo is a more sustainable option, it didn’t feel particularly sustainable or eco-friendly to be replacing toothbrushes so often. Nor was it purse friendly. In the end I switched to using a Preserve toothbrush. These are made from recycled plastic, and once you’re done you can send the toothbrush and packaging back to Preserve for complete recycling. I’ve just replaced one that I used for a good few months, which is a lot more like it when it comes to the lifespan of a toothbrush. If you are looking for other ways to green your beauty routine do check out my health and beauty category for more inspiration! It goes without saying, I wasn’t compensated to write any of this. I paid for and bought all of the toothpastes and toothbrushes with my own hard-earned money and wanted to share my experiences and thoughts with you guys! I’m really big on disclosure so if anything was sent for review or I was compensated you’d be the first to know about it! I just started using a Preserve toothbrush and it’s great. I haven’t heard any substantial evidence against fluoride, but we do have activists here who are trying to get it out of drinking water. The problem is that it tends to hurt lower income families who don’t have access to dental insurance and rely primarily on fluoride in water for treatment. I love my Preserve toothbrush! We don’t have fluoride in the water in Scotland – some parts of England do. Scotland has historically had quite high levels of tooth decay in children, but the Government have really invested in children’s dental care and rates of decay are dropping. We are lucky here as children up to the age of 18 get free dental treatment, as do people on low incomes, and when you’re pregnant (and up to 12 months after the birth of your baby). Fluoride in toothpaste is a neurotoxin and is also partially responsible for brittle bones. One of the biggest problems with Fluoride (or hydrofluoralsalicic acid) is that it displaces iodine from your system and iodine is essential for thyroid function and brain function. When the US government included iodide salt in the diet, the National IQ rose by 15%. That was before the Oligarchs took over the country. Steer well clear of fluoridated toothpaste or water. there is ample evidence that fluoride in drinking water affects childrens IQ and has no effect on the health of their teeth! It is also a neurotoxin, so I applaud your activists who are trying to get it out of the drinking water. I like the sound of the Green People Minty Cool one; I tried a Kingfisher minty one but it tasted strangely salty and was putting me off brushing my teeth! I’ve not tried that one, but by the sounds of things I think I’ll stick to Green People! Again, thanks for the reviews! I first came across the Lush toothy tabs, but was a little hesitant about the method – so glad now that I didn’t even bother trying them! Will definitely pick up/order a tube of Green People’s Minty Cool paste when my current tube runs out. Thanks for posting. I hadn’t realised fluoride was a problem? Could you explain why please? Hi Kiran, I’m on the fence about whether fluoride in toothpaste is a bad or good thing. This is an interesting article about fluoride as a whole and adding to the water supply: http://www.nyrnaturalnews.com/article/qa-whats-so-bad-about-fluoride/ as is this one: http://www.huffingtonpost.com/dr-mercola/fluoride_b_2479833.html With toothpaste, the amount of fluoride that you’re ingesting is tiny, but I understand why people would want to avoid it in seeing as it was historically used as a rat poison! From my dentist . . . . <> No way would I keep a toothbrush as long as some of you have. Yuk. I floss and use diluted bi-carb (gently) on my teeth. They have never been so clean and tartar free and I am nearly 60. Sometimes I get energetic and make a batch of toothpaste with a tiny splash of vodka (euww) as a preservative. Aniseed oil is my favourite flavouring, with spearmint oil a close second. I have been using a brand called aloe dent whitening, must say my mouth has never been better, after using the usual whitening toothpastes for years with no effect after just 3 month on the aloe dent there’s a huge difference, its amazing that’s this is made in the UK but I couldn’t not find it in any shop, not surprising if you know how the world works, recently Holland and barrat started stocking it but i generally get it from a website. I’m so glad I came across this post (and your blog! ), I’m in the middle of testing fluoride-free toothpastes before going to the dentist and doing my own follow up post, my partner is also a second guinea pig – we have completely different tastes too! He loves a fluoride Lavera one but I refuse to buy it again – since I switched from SLS and fluoride toothpastes my throat is clearer and I no longer have to hack up phlegm after I brush my teeth every morning whereas he still has sinus problems so I’m hoping to find something fluoride-free for him that he likes and which hopefully has the same effect. He’s kind of liking a minty Green People one which I do like but I also like my two Jason ones and I’ve also got Earthpaste in Winter Green, it’s okay but it has trace amounts of lead and it spits as you squeeze it out so I won’t be buying it again. I tried a Lush toothy tab once in the Rose flavour and had the exact same reaction you did, they’re disgusting!! I thought maybe mint would be nice but I’m glad I’ve read your post! If you need an emergency toothpaste I’d sooner DIY it, you can just mix coconut oil with bicarb, it’s a little salty but I use it in emergencies and it works pretty well :) no need for the horrible Lush ones! Seems like Lush may have changed their tablets since your review. The ones I get come in a 100% recycled plastic container now. I don’t think they taste bad at all, I’ve been really enjoying them. I get enough foam to brush my teeth, and my teeth are left feeling clean. I certainly don’t think they taste disgusting. Can you recommend one that tastes the same as regular toothpaste, just sans the flouride? I don’t really care about the other credentials too much, just want fennel or similar, just a mainstream tasting one. Green People Minty Cool toothpaste – fluoride free and just tastes of mint. It’s my personal favourite! Really helpful post. I currently have perioral dermatitis and everyone recommends switching to a fluoride and sls free toothpaste so this is great! My pleasure Hannah! Hope you were able to find something that could help. Hi, I’ve been using an Aloe Vera one made by Forever Living. It tastes great to me and is really foamy (I do put a big squirt on). My 3year old daughter however hates it, so I’m on the hunt for a child friendly flavour flouride free toothpaste! I too have noticed a reduced tartar build up. I use and have for years an weleda toothpaste called ratanhia , which is great for bleeding gums. I love love the flavour and it has stopped my gum situation out. I came upon your brilliant article after finally identifying that it was the fluoride and sls in mainstream toothpastes that was causing my really dry mouth problems. Thank you so much! If I may ask have you appraised the biotene range please? Can I buy the Green People range in health stores or main supermarkets ? Hi Stephen, I got that same problem when using mouthwash with alcohol in it. I haven’t tried the Biotene range I’m afraid. Since finding the Green People minty cool stuff I’ve been fairly loyal. You can find often find the Green People range in independent health stores, although I haven’t found it in Holland & Barrett. I haven’t seen it in supermarkets. What I do is I buy the three pack in bulk from Green People (it’s free delivery). I haven’t looked back since going fluoride free three years ago, and I get a check up every 6 months and there has been no ill-effect on my teeth. Thanks for this. I’ve been watching the fluoride debate for some time and only when I found it mentioned in the Lancet did I start looking in earnest. I’ve put the link to this renowned medical journal below. Hi Andrew. If you live in a fluoridated area and want to get active, please email me: wmaf@live.co.uk. I’m Joint Coordinator of the UK Freedom From Fluoride Alliance. Boots no longer sell their ‘Smile’ non-fluoride toothpaste. I’ve been told that the shelf space was so valuable and Boots can make extra money by selling the shelf space to other toothpaste manufacturers. I have been desperately trying to find the next best thing. Euthymol is fluoride-free but has a really strong and overpowering taste. However, it can be bought in most Pharmacies. I rather like the idea of moving to sls free but will probably pass on The Green People since it costs £8 per 100 ml and even buying a 3-pack would still make it very expensive. Sarakan sounds intriguing and I would really like to have whiter teeth. 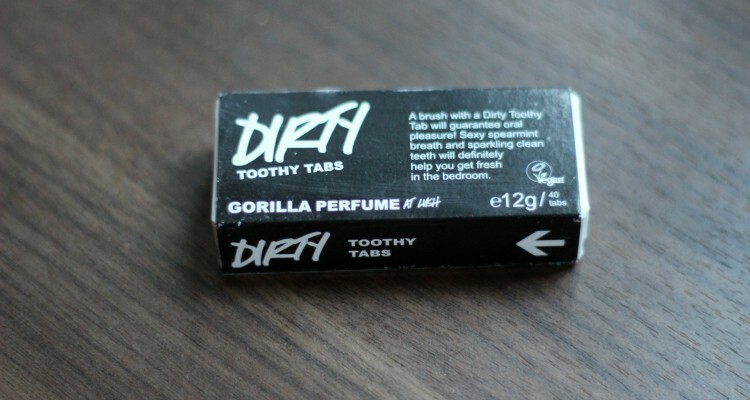 Thanks for this post, I have recently tried some free samples of toothy tabs and although I didn’t like the ‘Boom’ charcoal ones, the minty tabs were great, it was like brushing my teeth with an extra strong mint. My partner said they were salty but I didn’t notice that. My only complaint was the inclusion of Saccharin. Willing to try toothpastes next, I wonder if anybody does samples as some can be expensive, especially if you don’t like them. I haven’t come across samples, but i will let you know if I find anyone! I can really recommend the Green People mint one! I am interested in this as I have an underactive thyroid and I know that fluoride could affect my body’s absorption of the thyroid hormone I now need to take. But, I have very sensitive teeth, so I use Sensodyne toothpaste, and if I stop using it for any length of time I notice the sensitivity coming back. I wonder if there is a fluoride-free toothpaste for sensitive teeth – I guess that’s a bit too niche! I’m using sensodyne too but switching between it and green people fennel and propolis and occasionally my husband’s normal toothpaste. I like using the green people one between the others. So far my teeth have been ok. My teeth can get really sensitive usually after sugar and sometimes at random. I find the green people toothpaste much better as someone mentioned- I don’t end up feeling ill when trying to spit it all out. I may try the mint one next though! Thanks for this everyone- was useful to read…I needed some confidence in using more natural toothpaste- hard when it’s not so readily available- makes you think its not good enough.